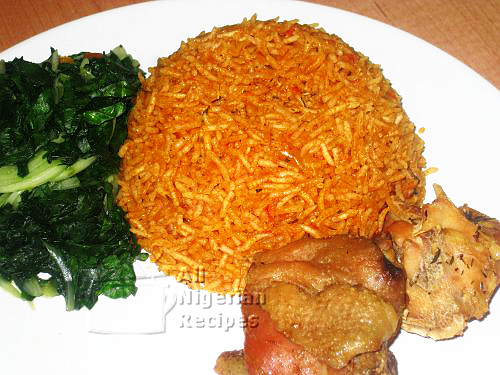 We prepare the classic Nigerian Jollof Rice and indeed all Nigerian rice recipes with the long grain parboiled rice. I have received lots of requests from lovers of basmati rice and jasmine rice to make a page about how to cook Nigerian Jollof Rice with basmati and jasmine rice. Basmati rice is quite similar to long grain parboiled rice in terms of nutritional content (see table below) but basmati rice is a soft rice variety hence if you try to prepare it with the method detailed for the classic Nigerian Jollof Rice or any other Nigerian rice recipe, it will be a disaster! The recipe detailed on this page works for every soft rice variety: basmati rice, jasmine rice etc. Values are per 100g of rice. Basmati rice is simply too soft for one-pot rice recipes – these are recipes where you cook the rice and ingredients in one pot: Jollof Rice, Fried Rice, Coconut Rice, Concoction Rice etc. For large quantities of rice, use the long grain parboiled rice instead. If you must use basmati rice when preparing large quantities of rice, it is safer to cook the rice in small batches. Prepare the tomato stew. Visit the Tomato Stew page for details on how to do that. You should always prepare tomato stew before hand and keep in your freezer. This is so that whenever you want to cook any jollof rice related dish, you simply defrost and add to your cooking. Cut up the chicken and rinse. Cook with the thyme, stock cubes and onion (chopped). Hen takes time to cook properly, use a pressure cooker if you have it. Rooster cooks quicker but is not as tasty as hen. Put the dry basmati rice in a sizeable bowl. 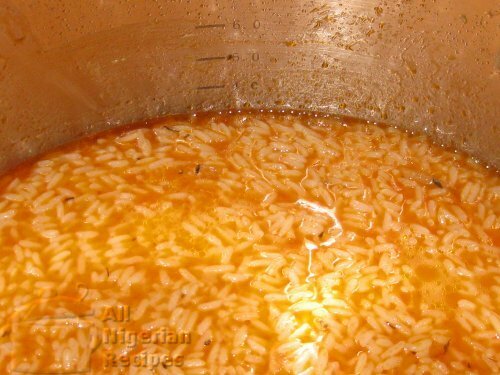 Boil some water and pour enough hot water into the bowl of dry rice to cover the rice. Stir very well making sure the hot water touches every grain of rice. Then pour it into a sieve immediately to drain. When the chicken is done, add salt, stir and separate the chicken from the stock. Set the stock aside. Grill/Broil the cooked chicken in an oven. You may also deep-fry it. This gives it a golden and more presentable look. Pour the chicken stock and the tomato stew into a sizeable pot. If the mixture is too thick, add a very small quantity of water. Add pepper (pound or blend it first) and curry powder. Stir very well, cover the pot and cook till it boils. Add the drained basmati rice, stir and make sure the liquid in the pot is at the same level as the rice. If less, top it up. If more … mmmh lol. It should not be more. Cover the pot and cook on low to medium heat till all the water dries up. When you taste the rice, you will notice that it is still raw and hard to the bite. Please do NOT add more water to it. Stir the rice with a wooden spoon. You can add more tomato stew before stirring if you think it is not red enough. Turn off the heat, cover the pot with aluminium foil followed by the pot cover. Make it as airtight as possible so that no heat escapes. Leave it like that for 5 to 7 minutes, at most, 10 minutes. After that, open the pot, stir and you will notice that the rice is now well done, not soggy, has loose grains and it is tasty. That's how to cook Nigerian Jollof Rice with basmati rice so that it is tasty, not soggy and not burnt. If you have any questions about this recipe, click here to ask me. Serve with Fried Plantain, Nigerian Moi Moi, Nigerian salad, Steamed Veggies or Coleslaw.